How to Avoid Having Your Car Stolen - Lanes Insurance Inc. Stolen vehicles are a big problem across the country. 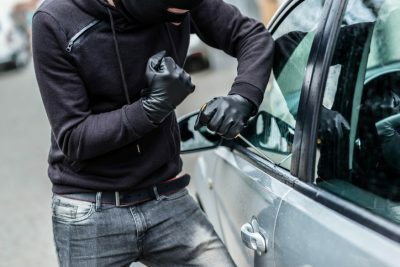 According to the Insurance Bureau of Canada (IBC), each year auto thefts cause about $1 billion in losses, which includes about $542 million for insurers to repair or replace the vehicles. Statistically, only 50 per cent of stolen vehicles are found, and they are usually damaged. Each year the IBC publishes a list of types of vehicles that are most often stolen throughout the country and in each province. The ten most commonly stolen types of vehicles in Canada in 2016 were either SUVs (the Toyota 4Runner, the Cadillac Escalade and the Acura ZDX), or trucks (overwhelmingly Ford F350s). Not surprisingly, in Alberta in 2016, the top ten most stolen vehicle types were all trucks. And they were all either a Ford F250 or 350 of the year 2007 or earlier. This can be attributed to the fact that since 2008, all vehicles sold in Canada must come with an electronic immobilizer installed, which is an effective deterrent against hotwiring. Be especially cautious leaving your vehicle if you own a Ford truck that’s ten years old or more. Never leave your truck idling on its own while you run a quick errand. Also consider installing an alarm system, and if you do make sure to let your car insurance broker or provider know. It will likely earn you a discount on your insurance rates. Stolen vehicles in Canada have three common fates. The first is that they are stripped and then sold for parts to unsuspecting consumers. Second, four-wheel drive vehicles like SUVs and trucks are often clandestinely shipped overseas, where there is major black-market demand for them. Finally, many stolen vehicles are used in the commission of other crimes by criminals seeking to cover their tracks by using someone else’s car, or are simply abandoned after a joyride. In May 2017, Metro News Calgary reported that Calgary was leading the nation in the total amount of auto thefts. The numbers have since eased a bit, but that doesn’t negate the fact that in 2016 Alberta had the dubious distinction of being the car theft capital of Canada. More than 3,900 vehicles were taken from their rightful owner in this province, with more than 900 stolen in Calgary alone. That’s a rate of 2.5 each day! Metro estimated the value of each vehicle at an average of $20,000, which puts the total loss to owners at $18 million. The City of Calgary has a comprehensive online crime map that is regularly updated, where residents may check to see what sorts of crimes are most prevalent in each area. The five Calgary communities where you are most likely to have your car stolen are Forest Lawn, Albert Park/Radisson, Pineridge, Marlborough and Dover. Car alarms, vehicle immobilizers, steering wheel locks can all be deterrents for thieves. And a GPS tracking system may not stop someone from stealing your car, but it may make it a lot easier to find. Unfortunately, licence plate thefts have also been rising in Calgary and Edmonton. It can be easy not to notice … who checks their licence plate unless you’re affixing a new registration sticker? Avoid having your licence plate stolen by using anti-theft screws and by parking in a secure garage or well-lit, well-trafficked area. If you can’t locate your vehicle, first make sure it is indeed stolen. Is it possible you simply forgot where you parked? Or that you could have been towed? Although not desirable, both options are better than alerting police to an emergency that doesn’t exist. Once you have determined that your car has been stolen or is not locatable, stay calm and follow these steps.